Need an excuse to drink more? 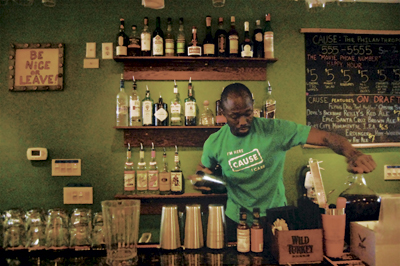 At Cause Bar & Restaurant on U Street, happy hour can changes lives throughout the District, country and world: 100 percent of the net profits are donated to charities. Founders Raj Ratwani and Nick Villele opened the venue, also called the PhilanthroPub, in October. The pair came up with the idea five years ago, when they were earning Ph.D.’s in cognitive psychology at George Mason University. Ratwani said he was frustrated with his inability to spur social change, but realized that despite his busy lifestyle, he still found time to grab a bite to eat. stool are made from recycled wood. Their commitment to sustainability also manifests itself in the restaurant’s decor. A glass mosaic, comprised of 1,200 beer bottles, spells out “cause” along the restaurant’s back wall. While pub patrons are not solicited for donations, the owners work to raise awareness about the causes they represent. Selected organizations must fit certain criteria set by an external advisory board: whether or not its work is sustainable, if it can expand to help more people and how much exposure Cause can provide, based on the charity’s potential appeal to patrons. Martha’s Table, an organization that works to alleviate poverty in the D.C. area through educational programs, nutrition and clothing, is one of Philanthropub’s featured causes this season. Ann Brookover, director of development for Martha’s Table, said she thinks the affiliation with Cause will bolster exposure citywide. Cause has found its place in academia as well. Professor Steven Livingston, who teaches in the School of Media and Public Affairs, visited the pub with graduate students in his course about the integration of the technology and advocacy. “I thought, gosh, it’s a course – it’s a graduate seminar on how communities work together to produce social outcomes, and what better place to hold a couple of our meetings than in that environment,” Livingston said. Livingston said Cause’s model and mission could be replicated across the country. In Houston, The Original OKRA Charity Saloon donates 100 percent of proceeds to charities based in the city. Portland’s Oregon Public House, which began construction in fall 2012, will offer its patrons a selection of organizations to support with every purchase. Ratwani noted that the pub offers both an opportunity for youth to display altruism and an opportunity for community members to alter their perceptions of younger generations. This article appeared in the March 25, 2013 issue of the Hatchet.